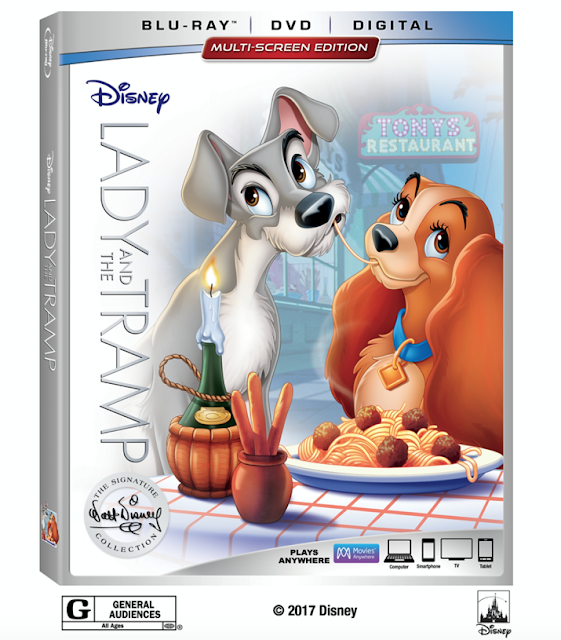 What better way to celebrate today’s National Spaghetti Day, than announcing this February, Disney’s cherished animated classic, “Lady and the Tramp,” will join the highly celebrated Walt Disney Signature Collection! As one of the greatest love stories ever told, “Lady and the Tramp” is sure to melt the hearts of generations with its beloved characters, brilliant animation, memorable music and sweet sentiment. Every member of the family will treasure this timeless tale—loaded with three versions of the film, classic bonus material and three all-new features—when it heads home on Digital and on Movies Anywhere Feb. 20 and on Blu-ray on Feb. 27! BURBANK, Calif. (Jan. 4, 2018) — This February, Disney’s cherished animated classic, “Lady and the Tramp,” joins the highly celebrated Walt Disney Signature Collection. Every member of the family will treasure this timeless tale—loaded with three versions of the film, classic bonus material and three all-new features—when it heads home on Digital and on Movie Anywhere Feb. 20 and on Blu-ray onFeb. 27.